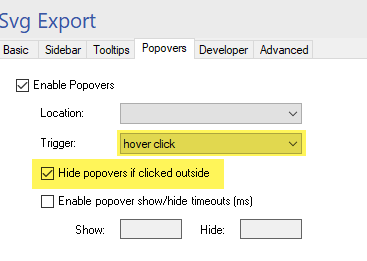 New: add “hover + click” tooltip and popover behavior. This feature is supposed to solve the problem when you want to publish tooltips or popovers, that have some hyperlinks in the text body. Now you can enable them to show up and disappear if the user moves the cursor outside of the shape. However, they will stay if the user has clicked on the shape. The new setting is shown on the screen below, select trigger as “hover click”, i.e. both. You can also select “Hide if clicked outside” if you want the “fixed by click” tooltips to disappear when clicked outside of the shapes. 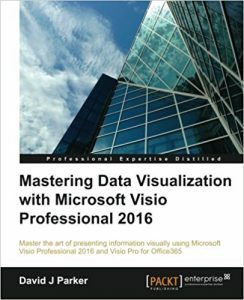 Recently finished reading the David Parker’s “Mastering Data Visualization With Microsoft Visio Professional 2016” book. Highly recommended if you already have some experience with Visio and want to know more about its data visualization capabilities, and how these can be used in your infrastructure. Some unique topics covered – creating custom data graphics and Pivot Diagram Add-on. 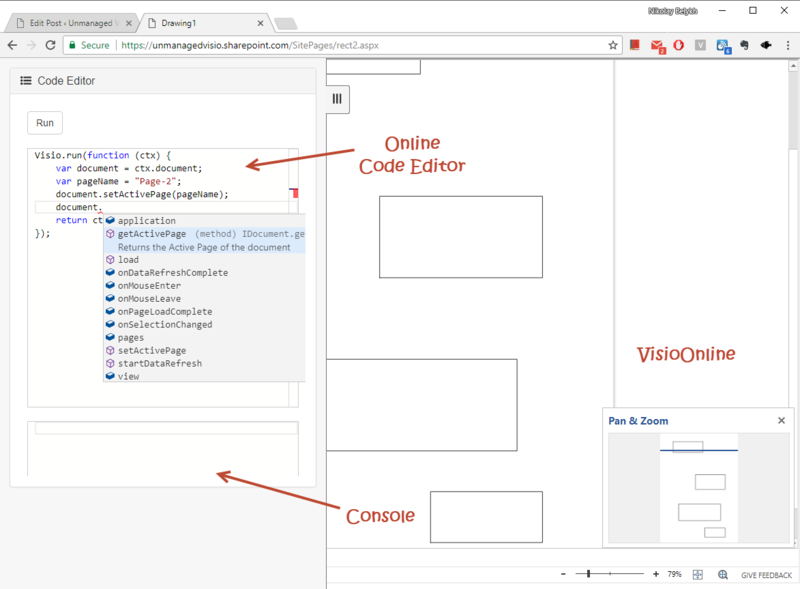 a new script editor is added that allows to play with scripting for the new Visio Online with comfort. The experience is somewhat similar to the ScriptLab, a project to support other Office applications, when you can write some code and then run it both online and offline. The HTML Export plugin supports automation API (can be called programmatically). This allows you to execute export with code. The addin can be used from any language that supports automation, including in particular Visio’s VBA, .NET languages, powershell, etc. Basically, if you can call Visio API, you should be also able to call the plugin API. The type library is installed with the addin (named is called “GenerateVisioSvg”), and you can use it to add a reference to your project for autocomplete. Consider a following scenario: you have a diagram containing network devices (servers) and you want to start PUTTY client when any of those devices is clicked to open SSH session to a corresponding device. And you want that to be on a webpage. A possible solution to that on windows is to register a custom application protocol and map it to launch an executable. You can see a common example when “callto:” link opens Skype. Here are some explanations. This works for all major browsers, works also in Visio (without any macros). With Visio (and a tiny SVG Publish script), this approach can be customized. 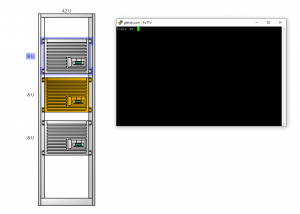 Suppose you have a rack diagram, which already has all server addresses ready. SVG Publish can convert the data into custom links that can be used to launch an executable (PuTTY in this example). 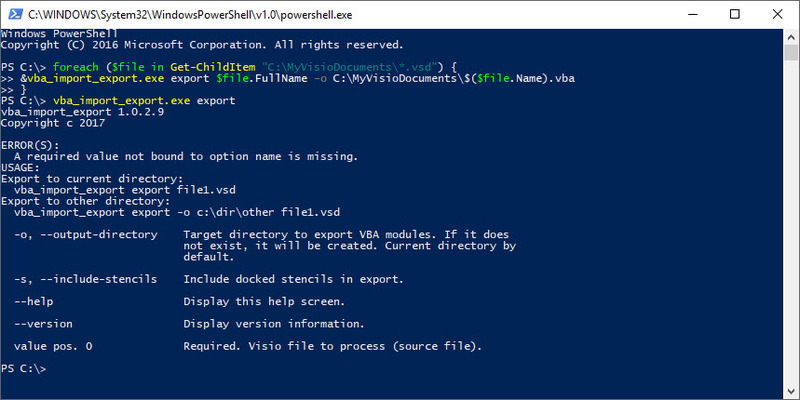 The import/export VBA extension supports not only the UI (button-click), but also command line interface! Below are some examples of what can be done using command line. and visible in the template as file “vp-script.min.js” and “vp-style.min.css” respectively. The default template, installed with the app, is also there. Way 1. Just drop the content of the file into “immediate” script window on the diagram. Remember to uncheck corresponding option, if you ware overwriting it with custom code. Way 2. You can use these as samples to create your own custom template. To do so, create a copy of the vp-template.html file, and check “use custom template” in the settings. A few months ago I released a visual studio extension, that provides autocomplete if you edit office ribbon files. The extension is open source, and published on GitHub. What it can do for you – it can assist you if you edit the XML files to define interface for your extensions in the Visual Studio editor. The code is based on famous glyphfriend extension (if you don’t use it yet – you should start, it’s great). Initially there was a plan to merge this part into that extension, but it proved to be quite heavy with all those 5000 office icons, so it is now separate thing.